Well, like Chii commented in her vector, she had the idea but have problems in finishing the wallpaper using Kirino's vector with Nadeko's cosplay. So, I caught the wallpaper. 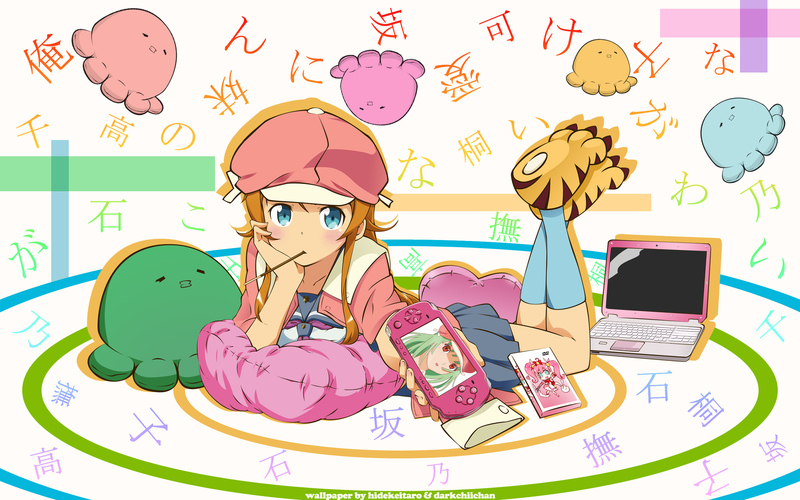 My first idea was put the "monster pillow" on side the Kirino flying with various colors. The kanjis and hiraganas are similar to Bakemonogatari OP (Renai Circulation) but using the pieces of Oreimo's title and Kirino and Nadeko names in japanese. With all job, i think that this wallpaper is 50% mine and 50% from Chii. Enjoy! Very Beautiful wallpaper, thanks for sharing! I love your wallpaper! Kirino is very cute in this wall! congratulations! Very Nice wallpaper, it has been added to my collection of walls from here. It merges two great series! Awesome job! Very funny. Very cuuute.. Thank you!